When I turned 14 I decided I was a vegetarian. Having grown up in Seattle I was surrounded by vegetarians and vegans and I thought it was natural for me to become a vegetarian myself. My dad was a huge meat eater, but my mom was great about buying me ingredients to make my own meals. It was during these years that I learned to read and create cookbook recipes and modify ingredients to make dishes vegetarian. I stayed a vegetarian until I was in my mid-twenties. When I moved to West Virginia to attend graduate school I added meat back into my diet. Then I met my husband, who is obsessed with pork. My two boys have followed suit and definitely enjoy meat in their diets. While I do love meat, I also try to have at least 1-2 dinners a week that are vegetarian or vegan and our lunches 99 percent of the time contain no meat. With one of the highest levels of childhood obesity in my state I am determined to keep my kids from following this statistic. Veggie burgers are a household favorite so I was excited when the June issue of Everyday Food had a recipe for Pinto and Rice Burgers, which looked very easy and delicious. This recipe has 10 ingredients, plus toppings. It takes 15 minutes of prep and cook time and makes 8 servings. I had no problems finding any of the ingredients at my local grocery store and made no ingredient modifications. For the toppings I used cucumbers, avocado, mayo and mustard. I found that the burgers took much longer than the 3 minutes per side suggested by the recipe. I prefer that my veggies burgers have a nice brown crunchy exterior so I let my burgers cook approximately five minutes per side. The bunches of scallion available in my area are huge so instead of an entire bunch I used five large scallions in total. Finally I ended up with 6 burgers in total, my family prefers larger burgers so I made mine slightly larger than the recipe. I followed the remainder of the recipe as written. Everyone in my family loved this recipe! The burger was not dry as many other veggie burger recipes can be and the avocado topping was absolutely perfect. The cilantro added great flavor, without the burger tasting too much like cilantro. 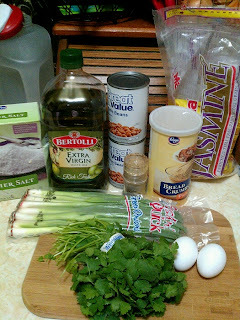 The beans, cilantro, scallions and beans blended together perfectly and the burgers browned very nicely in the olive oil. I was very impressed by this recipe and will definitely make it again in the future. This recipe is currently not available online, but can be found in the June issue of Everyday Food Magazine. 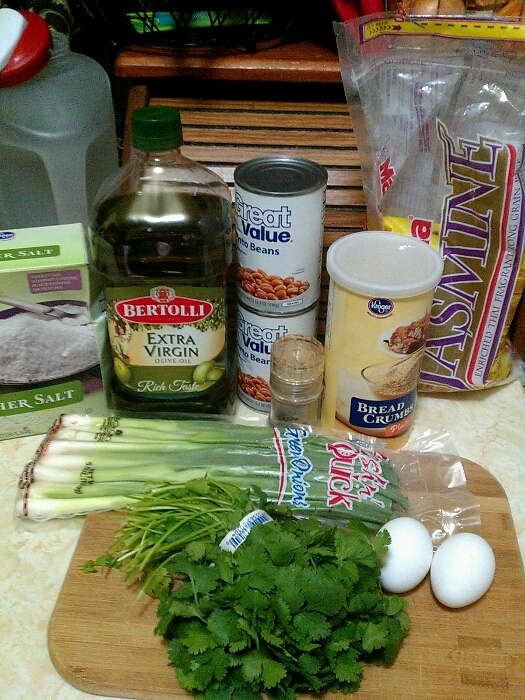 Here is a link to another Rice and Pinto Bean Burger recipe. They really were yummy and I love that they are vegetarian! I'd love these...with chili con carne. :) I can't go meat free! My husband would probably prefer it with chili con carne also :) He love meat like you! They really are yummy though and you don't notice the lack of meat, I promise! I never thought to use pintos and rice for a veggie burger. I've have black bean and veggies, so I am excited to try with pintos and rice. Yum! I love black bean burgers, yum! I had never tried burgers with pintos and rice either, but they turned out really well! Good luck :) My husband actually has discovered that he loves veggie burgers, which I'm very happy about!